In the tarot, water (cups) relates to the field of emotions, and the subconscious mind; earth (pentacles) relates to everything that is of the phenomenal world, in the yoga practice prakrti ; wind (swords) relates to our waking consciousness (Eakins, Tarot of The Spirit), the breath of life. It is the nature of the mind, like water, to be still, and clear, and reflective. When water, like the mind, has movement, sound, or becomes cloudy it is because it is being tempered by other elements/outside forces. The mind, like water, has no boundaries. Over time we have been conditioned to understand and interact with our world in a way that is boundary-d: Me/You; etc. Which isn’t necessarily bad, but can actually be quite useful much of the time, and can help set up the conditions for healthy, equitable, and loving relationships. And so it isn’t so much an actual contradiction as it is linguistic and therefore intellectual that we are all one and separate at the same time. The Life that animates me is the same Life that animates you, but I am not You; You are not Me; yet we are One. Our language shapes our minds, which in turn shapes our world. How we are able to transmit this information into the world is in direct proportion to how we are able to inquire into the experience of Oneness/Aloneness, and practice feeling into that experience in the context of our relationships. How do we rest into what we know without becoming rigid, and how do we lean into what is unknown without becoming lost? Integration of new lessons, of new experiences into the felt understanding of what it means to be human is invaluable. We become lost, or perhaps a better way to express it is, we fall asleep when we are reliant on old patterns, when we cease to inquire, when we cease to be curious. We are always in process, even in death there is no finality. It is of vast and great importance to get clear in intention: what motivates me? what do I care about? How do I reflect that back to the world, and how do I receive what is reflected back to me? Inquiring into symbolism is an ancient practice, and like the yoga practice it is a living system. How we interpret what we see, how we express what we interpret is also a living system in process. But unlike dogma or systems that become institutionalized, we have a choice in how we interpret and transmit. And whether we are awake to it or not, we are always choosing. 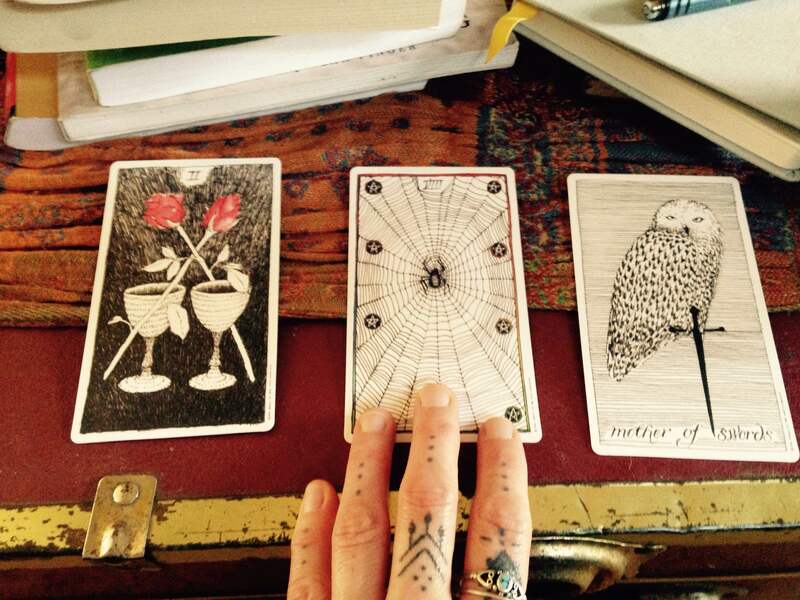 The yoga practice, and the practice of reading the cards are tools, technologies in an interwoven web of infinite connection that enable us to be more wakeful so that we may be our most complete selves.